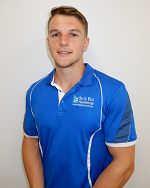 Peter has been part of the North West Physiotherapy – Eatons Hill team since early 2018. He graduated from the Australian Catholic University at the end of 2017 and brought with him the most up to date, researched techniques and practices. Peter has a significant following at the clinic and is recognised for his holistic approach to care by utilising Pilates, Hydrotherapy, Exercise Prescription and Dry Needling to compliment his hands-on manual treatment style. Pete has a specific interest in treating neck and lower back pain and also offering sporting and injury rehabilitation to a diverse range of patients. Pete also thrives off the challenge of delivering pain relief and long-term solutions for more acute or chronic injuries. Outside of work you will find Pete keeping in shape at the gym, practicing mixed martial arts or at a cricket match with family and friends. Peter runs Pilates on Tues 6pm, Weds 7am, Thurs 6pm & 7pm and Fri 9am and also Hydrotherapy on Weds 1pm at the Albany Creek Leisure Centre.